TIME TO THINK COMPOST! This is the last really free lunch on the planet–at least for your garden. You can pay for a composter by avoiding the purchase of just three bags of lawn fertilizer. Compost is much better than chemical fertilizer because it adds structure to soil and releases nutrients slowly. 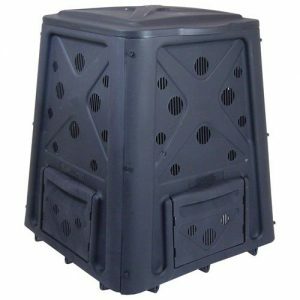 Why get a composter now? With the arrival of spring, you’ll be cleaning up your yard. Where to put that debris? In your composter! The City has a truckload sale every spring, but Amazon has better deals, with free shipping–some assembly required. If you’re just getting started, try a Redmon 65 gal composter for only $55–inexpensive because it’s small. The Algreen 100 gal is $76, and the Exaco450 120 gal is $90. You can recycle all the fall leaves from your yard–using 4 composters plus a temporary leaf corral. Not to mention, it’s a great way to get rid of most kitchen scraps (no meat!) without adding to the landfill. Questions? Email davidthompson20@aol.com. I’ll even make house calls!